Poultry Products Northeast is looking toward a very bright future. The food distribution company was acquired this week in a management-led buyout from its longtime owner, Julian Stogniew. The new owners put a financing package in place exceeding $30 million to recapitalize the company and finance the construction of a modern distribution and processing facility. Under Stogniew’s leadership, PPNE grew from a local poultry processing company to one of the region’s largest independent food distributors. Thanks to Stogniew, PPNE is strongly positioned for this investment to achieve the long-term plans of the new ownership group. “This new group of owners share my commitment to our employees and I look forward to watching them lead PPNE to the next step in its evolution,” said Stogniew. “We are grateful to Julian and the dedicated team at PPNE who have worked to build the company to what it is today,” said Bill Conrad, CEO & President of PPNE. “We wouldn’t be where we are today without their efforts and commitment. With his blessing, we are excited to look forward to the future." The new ownership group’s financial investment will facilitate the construction of the new 105,000-square-foot building which will be developed by Brennan Investment Group, one of the largest owners and developers of industrial property in the country. The new facility, to be located in Londonderry NH,The new ownership group brings extensive business experience to PPNE. Several of the investors have been involved with PPNE for many years and have an intimate understanding of the company and its employees. With this sizable investment, the primary goals of this group go hand-in-hand with PPNE: to continue building a long-term future for this financially independent food distribution business focused on center-of-plate products. PPNE Protein Specialist, Zack Martineau has the education, experience and an excellence in the culinary industry that marks him as a key resources for our customers and sales force. Zack often accompanies PPNE sales reps to accounts to learn who our customers are, what their needs are and how he can help build the relationship. He meets regularly with chefs, kitchen staff and business owners throughout New England acting as mentor and partner; sharing his knowledge of protein selections, cuts, preparation, and cost efficiencies. Together, Zack and our customers come to understand how our product and their goals can combine to find a new, higher level of profitability and success. "My culinary career started at the New England Culinary Institute in Burlington, VT. Upon graduation I sharpened my skills at a local restaurant group, working my way through the ranks from line cook to executive chef. Spending 7 years with this restaurant group I grew as a well-rounded chef. Propelling my career into my next role as the opening chef of the Copper Door restaurant. There I developed a culinary team and menus from scratch. Moving forward into a more local boutique hotel company which challenged me with the farm to table concept. Taking what I learned the 10 years prior I then pursued the role of Culinary Director for a multi-unit company, overseeing 4 locations and 350 employees. This gave me the perfect opportunity to teach and mentor some of the great chefs in the area. Taking a step back from the BOH operations of the busy kitchens I took on the role of the Protein Specialist for Poultry Products Northeast. This role allows me to exercise my interests in the buying and selling side of the industry. Being the largest independent food distributor in the Northeast, I work closely in the USDA processing facility focusing on what it takes to be a successful protein distributor. As Protein Specialist, I also train and instruct the sales force about each protein category, and help our customers create value for their business. I offer support to customers and prospects on incorporating center of the plate proteins that we offer at PPNE into their menu." PPNE recently celebrated as a major sponsor of the 40th anniversary of Bobby Stephen's Fund for Education. The Bobby Stephen's Fund is a non-profit whose mission is to assist deserving New Hampshire citizens to further their career goals by means of scholarships to post-secondary educational institutions. Guest speakers included scholarship recipients, Governor Sununu, and Mayor Joyce Craig. The lively crowd was entertained by the NH Police Association Pipes and Drums and a live band belting out Irish tunes. 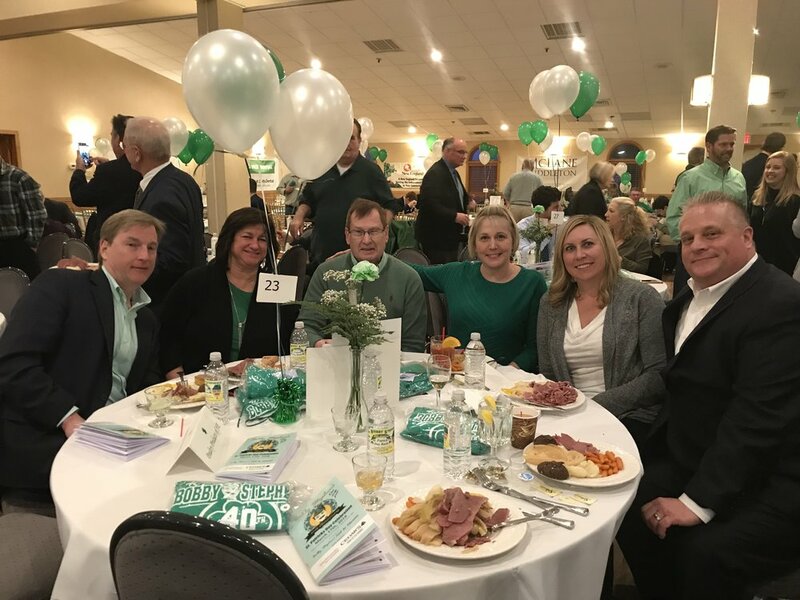 PPNE employees gave personal contributions to the Fund by participating in the silent and live auctions, and buying dozens of raffle tickets. Was it the smell of our 1855 and Pineland steaks grilling, or the Dubreton Pork sizzling in the rotisserie that brought the crowds to our booth? Or maybe it was our deli case boasting fresh beef, lamb, chicken and seafood that caught people's attention as they strolled by. Whatever the reason, we were happy to hand out over 3,000 samples, shake hundreds of hands, and share our story with many new friends. Poultry Products is getting the word out to all that will listen - we are center of the plate specialists. Selling all traditional and non-traditional proteins as well as produce, oils, and necessities that our customers have come to rely on us for.